Inspired by a day I spent last year photographing Sarah Adams for the catalogue to her show at the Maas Gallery in Cork St, London, I promised myself that in 2011 I would get a kayak so that I would be able to experience and photograph the North Devon coast at high tide and access places impossible for me to walk to at low tide. I’ve done a little rowing before as I had a small wooden boat moored on the mud banks of the Torridge minutes from my house; and I’d done a bit of kayaking in Manteo, North Carolina in Mayor Jamie Daniels double sit-on kayak. But it was the thrilling experience of paddling out to sea in preparation for and on the day of the shoot with Sarah that really excited me about the possibilities. I bought an bright yellow Osprey sit-on Kayak just over a month ago and have been taking it down to the ‘East-the-Water’ boat ramp as often as possible. This access to the river is minutes from my house and is made swiftly on a shopping trolley conversion. Paddling up and down the river with and against the tide is relatively easy but good for building up experience and body strength. Kayaking in the sea is a different matter entirely. The first time I tried paddling through the surf I got thrown out of the kayak all the time, especially when paddling into shore with the waves behind me; it was the equivalent of a bucking bronco whose only intent was to have me thrown off into the water. With more experience this got better but I think a good rule here is: if the sea is good for surfers then it’s bad for kayaking! My first ocean kayak with intent to make some pictures was a couple of weeks ago at Combe Martin. The sun shone and the sea seemed quite calm, just after high tide, with the waves crashing close to the shore. I wore a wetsuit, lifejacket and a pair of old Keens; my camera and tripod were packed into a dry sack with a towel and strapped to the rear of the kayak, I attached my self and the paddle to the kayak too. I was all set to paddle off, sat in the kayak in the seas shallows, adjusting my back support I took my eyes off the surf for a split second and I was rolled over with no apology. I took this as a warning that you can’t relax for a moment, even in small surf as it will throw the kayak over any chance it gets. I got back in, ignoring the comfort and support of the seat back and paddled with all my strength straight at and through the waves at a right angle to the shoreline; not slowing down or taking my eyes of the surf until I was passed them in the relative calm of the undulating waves. Giving a small promontory of rocks a wide berth I traversed to the right until from out at sea I was looking into the mouth of a cave I had called ‘Silver Mine, Combe Martin’ on a previous photo trip on a low spring tide. 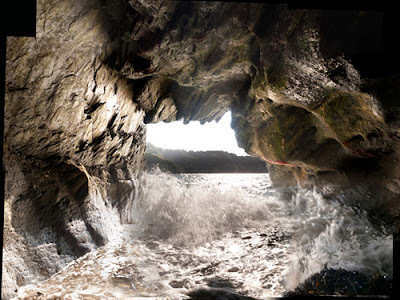 I could see that the back of the cave was clear of the receding tide although it’s entrance had a thick wall of surf. 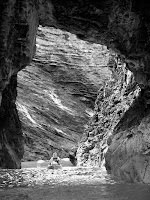 This was what I wanted, what I had seen in my mind’s eye, so with little hesitation I paddled as fast as I was able in a straight line for the mouth of the cave. I hit the pebbly shore at speed leaning right back to help the kayak ride as far into the cave as possible. I climbed out quickly and dragged the kayak to the back of the cave. The view from here was awesome. 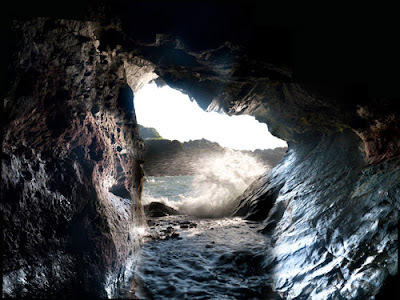 All of my senses felt heightened as I observed this familiar cave’s entrance being pounded by the surf and sunshine shining through it from behind. Sometimes with a big wave the walls of the cave would slightly darken, then for a split second, was bathed in an incredible refracted, diffused light as the wave eclipsed the sun. I dried my hands on the still dry towel and set up my carbon-fibre tripod in the shallow water, attached my camera and made a series of images, exposing the dark inside walls of the cave for a lot longer than the mouth and the incoming breaking waves. This sketch (above) is the first of I hope many images that I’m hoping to get to make along the North Devon and Cornwall coast at high tide. It’s made from a selection of 60 original frames, and is far from perfect in it’s present state, but I wanted you to see a direction that I’m heading as I’m really pleased with the power and fury of the surf and the way it gives a sublime beauty this coastal landscape. Below is the second sketch image of the cave next-door which I refer to as 'Lead Mine, Combe Martin'. All I had to do then was to get back to the beach at Combe Martin…..